There are novels that are important, novels you enjoy, novels that challenge your perceptions. And then there are novels that change who you are. Catch-22 is that novel for me. I don’t know what I expected from it. I’m not sure that I expected anything. But I was one person before I read it. I was another person afterward. It is, to be as direct as possible, the reason I am a writer. It showed me, for the first time, the remarkable, bottomless possibilities of the English language. It made me think in a way that no piece of entertainment ever had before. It made me question things I never thought to question. It made me laugh at atrocities, and be moved and affected deeply by frivolities. It was unquestionably the most accomplished piece of fiction I had ever read at that point in my life. Just as unquestionably, I’ve read better novels since. And yet none of them have affected me the way Catch-22 did. In the simplest possible description, Catch-22 is a novel about a United States bomber squadron stationed on the small island of Pianosa during World War II. The protagonist, Yossarian, seems to be something of a career malcontent. He pushes back against authority, against absurdity, against the rigid advance of fate itself. And yet, he’s not heroic. Yossarian is a deeply flawed individual. He doesn’t rebel because it’s the right thing to do; he rebels because he’s terrified that he will not make it home alive. His rebellion takes shape and gains momentum because it taps into the one thing every one of his fellow servicemen feels along with him, to varying degrees: fear. And it’s not unfounded. Colonel Cathcart, the squadorn’s commanding officer, keeps raising the number of missions his men have to fly before they will be sent home. Every time Yossarian gets close, the goal line gets pushed further out. Some of the other men try to assure him that he’s worrying over nothing…that the number of required missions can’t increase forever…that, at some point, this will all end. One by one, they are shot down in combat. Yossarian’s rebellion is one of desperate sanity. It’s born of seeing reality, of witnessing history, of watching the official lie unravel…revealing that there is no exit. It’s a funny book, and a sad one. It’s clever. It flits back and forth through time with only a handful of hints to allow readers to orient themselves. And–most surprising and devastating to me at the time–the characters that you love, that you rely on, that mean something to you, often don’t come back. Nobody is safe in the world of Catch-22. Every connection you make, like every connection Yossarian makes, is the first step toward disappointment, toward grief, toward, sometimes, betrayal. It’s the horror of war that largely takes place between missions, in the downtime. When you’re supposed to be safe. When you realize that the real enemy is on your side. When I finished reading it, I immediately started the novel over from the beginning. I’ve never done that again. 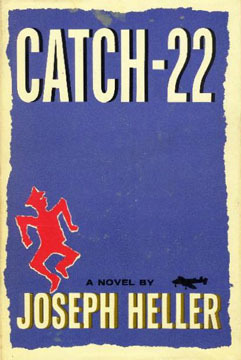 Catch-22 had more to say than a single reading could ever express. I knew that. I started back at page one. I read it all the way through once more. Since then, I must have read it twenty more times. It inspired me to become a writer. It inspired me to communicate. It convinced me that communication wasn’t just important…sometimes it is the only defense we have. Heller actually served in the air force during World War II. Catch-22 is fiction, but I think it’s safe to assume that it’s really fictionalized. This was his method of processing his experience. It was a crucial, urgent, instant classic of American literature. And it remains so today, for very good reason. There’s only a small number of books that I’ll ever read that will affect me nearly as much as Catch-22 did. It’s sad to know that I may have read them all already. It’s sadder to know that I may not ever get the chance to read most of them. Catch-22 is the closest thing that I have to evidence of fate. I saw it one day in my high school library. I don’t know why I bothered to pick it up. 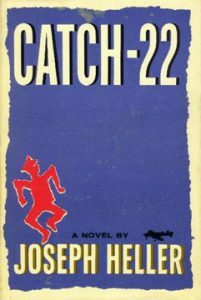 I knew the concept of a “catch-22” (a concept which takes its name from the novel, rather than the other way around), and maybe I just thought I’d want to read about it. I flipped through some pages. I read the copy on the inside flaps. And I did something I’d never done before: checked a book out of the library. I found that copy of Catch-22 by chance. I could have read anything else. Likelier still, I might not have read anything at all. But somewhere, in those pages, was the spark that would help me become the person I was supposed to be. I don’t know why I was in the library that day. What I was looking for. What I hoped to learn. But Catch-22 answered the questions I never realized I had. Years later I returned to that high school as a substitute teacher. I was a literature major in college at the time. I was a writer. I told one of my classes that story. About finding the novel in the library. About what an important moment that was, and how I found direction in a book I didn’t even know existed. It was an English class. It was part of a larger discussion I really enjoyed. I was with a room full of actual readers, against all odds. Young students who had things to say about books, and who wanted to share their opinions. That was heartening. At the end of the school year, I was teaching another class. In fact, I was leaving for the day. A young girl called my name, and I recognized her. I’d taught her a few times. She handed me that copy of Catch-22. The very one that changed me, so many years ago at this point. The same copy I brought home and pored over when I was younger. The same one that put me on a whole other track in my life. She’d torn out the anti-theft sticker and smuggled it out to me. It was a sweet gesture. I wanted to give it back to the library. To make sure it was there for another student, in the future, to have the same experience I had. …but for another student, it would probably be another book. One specific to them…not to me. And so I never did get around to returning it. I kept it. And on my shelf, right now, sits the most important copy of any book in my life. The one that reflected my soul back to me. The one that let me know, for the first time, who I was. Previous Previous post: Announcing: Choose Your Own Advent!